October 2, 2015 – Orion is a key piece of NASA’s journey to Mars. The spacecraft, which was first tested in space last year, will enable crew to travel to deep space on the journey to the Red Planet and bring astronauts home safely. It’s a critical technology NASA will use to test, demonstrate and hone the skills and capabilities humans need to operate farther and farther away from Earth. Water. Air. A temperate environment. A bathroom. These are some of the things astronauts need to survive the long journey back to Earth from Mars. 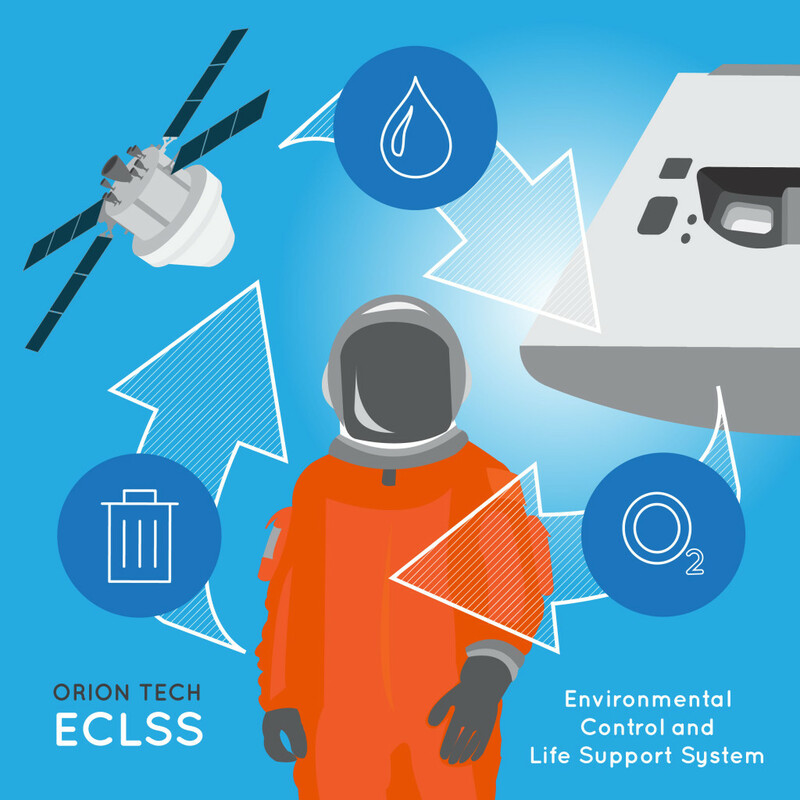 NASA has developed an environmental control and life support system on the International Space Station and is designing such a system for Orion. The system can recycle carbon dioxide and make it back into useable air and process urine to make it into potable water, for example. Right now on the space station, engineers and astronauts are testing a filtering system for efficiency and reliability on long-duration missions. The investigation uses an amine-based chemical compound combined with the vacuum of space to filter and renew cabin air for breathing. When astronauts travel home from Mars, they won’t be able to count on the arrival of spare parts or extra supplies if something breaks or gets depleted, so engineers are hard at work developing reliable and robust technologies to keep crews alive and healthy in space. Astronauts traveling to and from Mars will be far away from the protective shield of Earth’s atmosphere and magnetic field, and their spacecraft and its systems will need to be able to protect against the full spectrum of space radiation. NASA is working now to develop protective methods. Orion will use items already on board to protect the crew and create a temporary shelter in the aft bay of the spacecraft, which is the inside portion closest to the heat shield. This location minimizes the amount of equipment to move around while maximizing the amount of material that can be placed between the crew and the outside environment. The items that will be used include supplies, equipment and launch and re-entry seats as well as water and food. 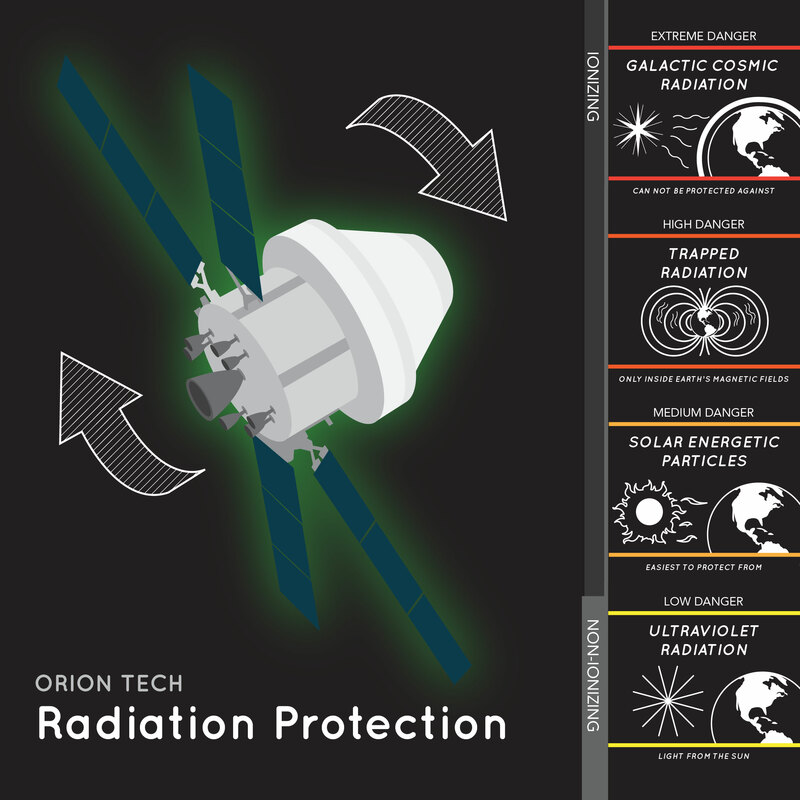 By using the items already on board, the astronauts benefit from additional shielding without adding to Orion’s mass. A spacecraft needs power and propulsion in space to refine its trajectory during the trip back to Earth. Orion will include a service module capable of helping the spacecraft make any necessary mid-course corrections. A service module provides power, heat rejection, in-space propulsion and water and air for crews, and NASA is working with ESA (European Space Agency) to provide Orion’s service module for its next mission in a partnership that will also bring international cooperation on the journey to Mars. The service module will provide propulsion, batteries and solar arrays to generate power and contain all the air, nitrogen and water for crews. The ESA-provided element brings together new technology and lightweight materials while also taking advantage of spaceflight-proven hardware. 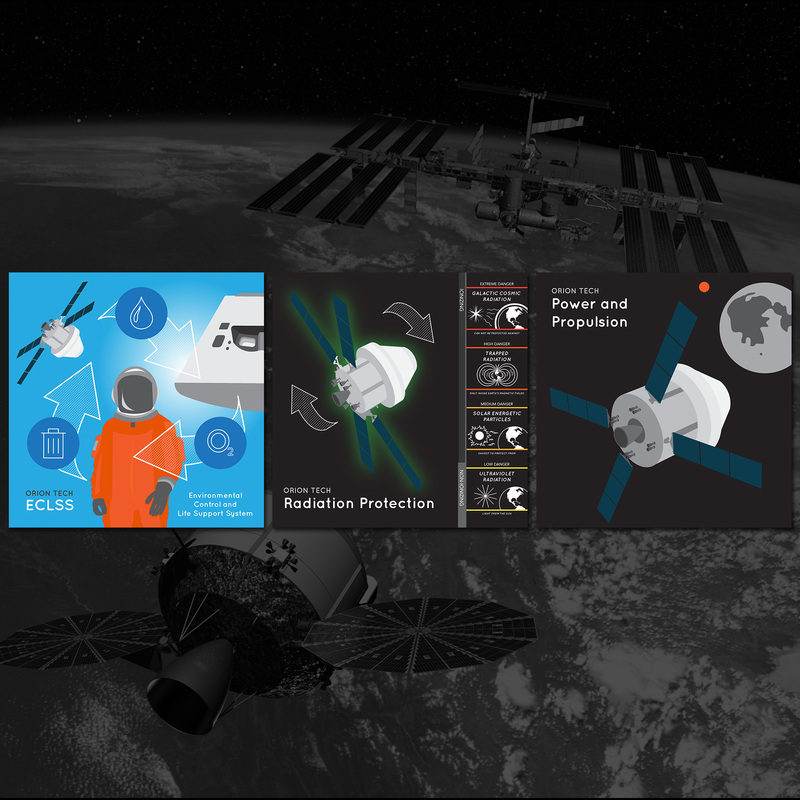 For example, ESA is modeling several key components — like the solar arrays — from technology developed for its Automated Transfer Vehicle-series of cargo vessels, which delivered thousands of pounds of supplies to the space station during five missions between 2008 and 2015. NASA is providing ESA one of the Orbital Maneuvering System pods that allowed space shuttles to move in space to be upgraded and integrated into the service module. 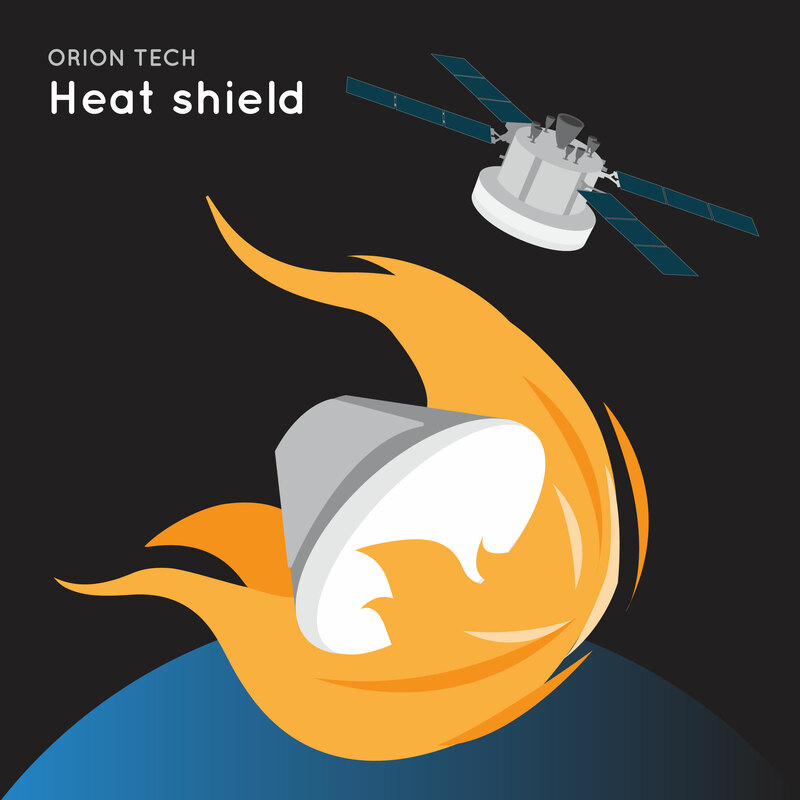 When an uncrewed Orion was tested in space in 2014, the heat shield withstood temperatures of about 4,000 degrees Fahrenheit, or about twice as hot as molten lava. That heat was generated when the spacecraft, traveling at about 20,000 mph back toward our planet, made its way through Earth’s atmosphere, which acts as a braking mechanism to cause friction and slow down a returning spacecraft. Its speed was about 80 percent of what Orion will experience when it comes back from missions near the moon and will need to be even more robust for missions where return speeds, and therefore reentry temperatures, are higher. Orion’s heat shield is built around a titanium skeleton and carbon fiber skin that provide structural support. A honeycomb structure fits over the skin with thousands of cells that are filled with a material called Avcoat. That layer is 1.6 inches at its thickest and erodes as Orion travels through Earth’s atmosphere. A spacecraft bringing crews back to Earth after a long trip to Mars will need a parachute system to help it slow down from its high-speed reentry through the atmosphere to a relatively slow speed for splashdown in the ocean. 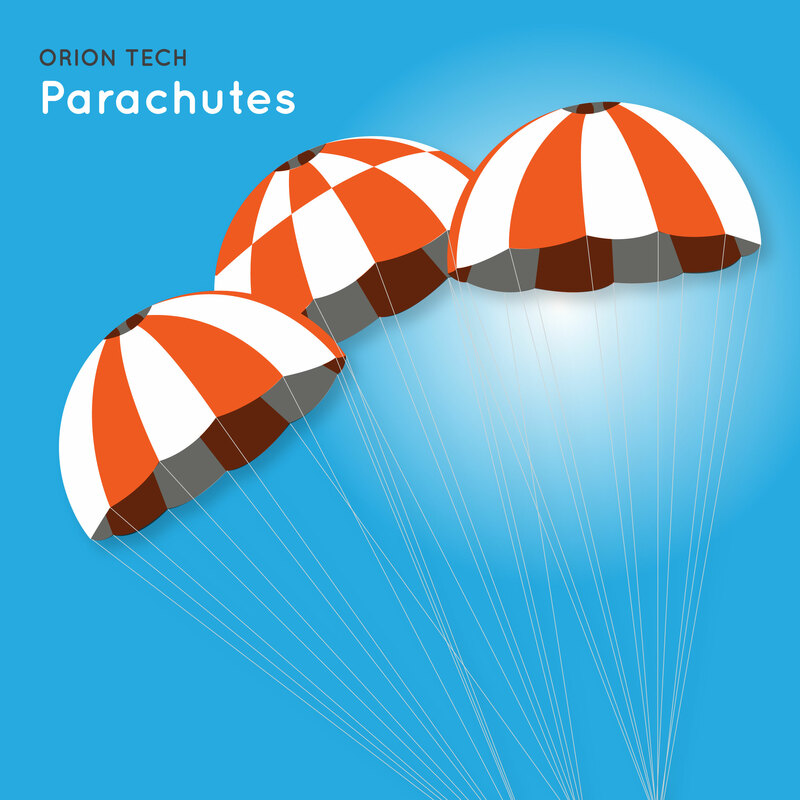 While Earth’s atmosphere will initially slow Orion down from thousands of miles per hour to about 325 mph, its 11 parachutes will deploy in precise sequence to further slow the capsule’s descent. There are three forward bay cover parachutes that pull a protective cover off the top of the capsule, two drogue parachutes that deploy to stabilize the spacecraft, and three pilot parachutes that are used to pull out Orion’s three orange and white main parachutes that are charged with slowing the spacecraft to its final landing speed. The main parachutes are so big that the three of them together nearly cover an entire football field. 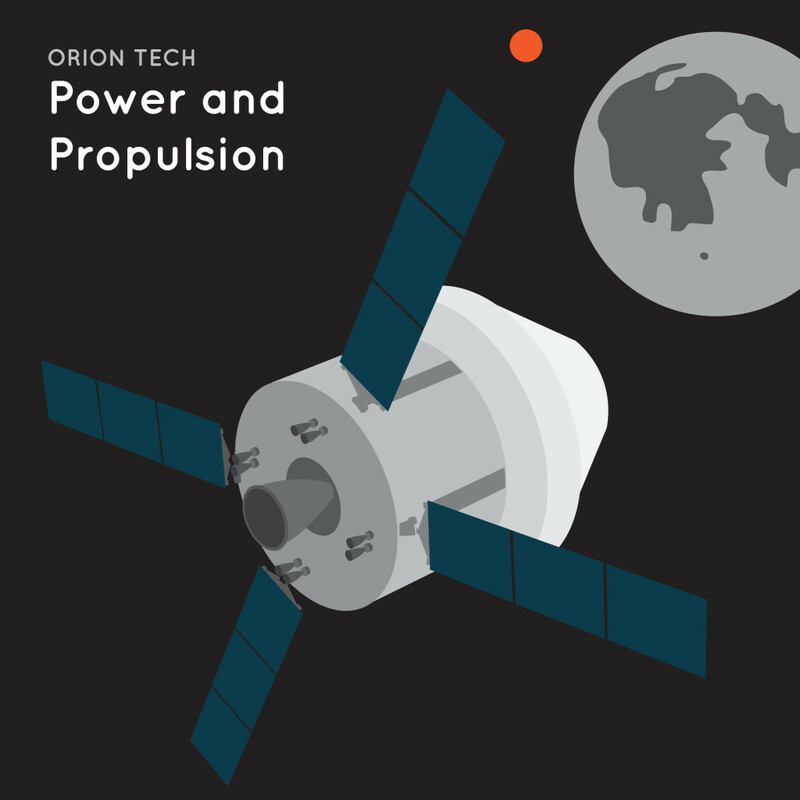 Engineers are currently building the Orion spacecraft that will launch on the world’s most powerful rocket, the Space Launch System, and will enable astronauts to travel farther into space than ever before on the journey to Mars.